Despite working in the whisky world, I don’t have that many impressive bottles in my collection. I don’t normally buy for investment, even if some bottles I have are now worth a bit of money, and apart from a handful of fortuitously purchased Karuizawas and enough 1978 vintage bottlings to fuel a good 40th birthday party in two years and 73.5 days, there’s not much to turn heads. 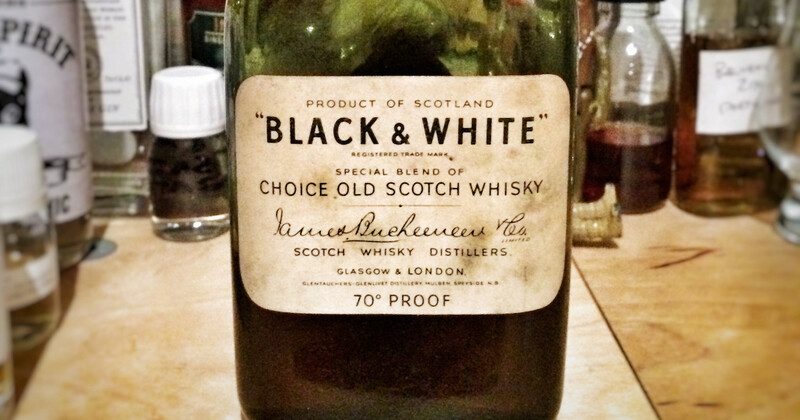 However, I have one bottle that I am impressed by – the oldest whisky I own. Not old as in ‘was in a cask for ages’ but instead ‘probably bottled back when we had a king’ old. So, for my penultimate advent calendar post, I present Black & White, by Appointment to HM The King. The ‘probably’ in my vague dating above is because they continued using the ‘By Appointment to HM The King’ labels for a little while after George VI died in 1952. The back label mentions January 1947 as the date it was written, so this is a late 1940s or 1950s bottling. Either way, it’s almost certainly a blend of whiskies that were distilled around the time of World War II. It’s a half bottle and I split it with a colleague from work, so I don’t have all that much. However, my aforementioned colleague let me keep the bottle (thanks Michael! ), knowing that I fetishise such things – I have way too many empty whisky and beer bottles in my house – and when it is finally finished it will find pride of place on the window-sill. Nose: Raisins, dried orange peel, oiled leather, wax-polished tables and lots of fragrant woody notes – sandalwood, sappy oak, freshly cut boards, old pot pourri and unscraped vanilla pods. It’s a bit musty and metallic, and more than anything smells old – like old attics full of boxes of clothbound books that haven’t been looked at for a long time. Palate: Very soft, with creamy vanilla sweetness to start. That continues through the center with metallic notes – old 1p pieces – and a hint of hairspray and air freshener popping up around the sides. Leather, raisins and icing sugar drift in and out, as well as damp forest notes – bark, ponds and wet leaves. Finish: The finish is initially soft, with some waxiness and cooked apple slowly becoming woody, before black pepper and a touch of nutmeg appear and then fade away. I’ve been fortunate to try a number of blends from the same era as my bottle, and this is classic – oily and weighty, although almost certainly not entirely the same as it was when it went into the bottle. 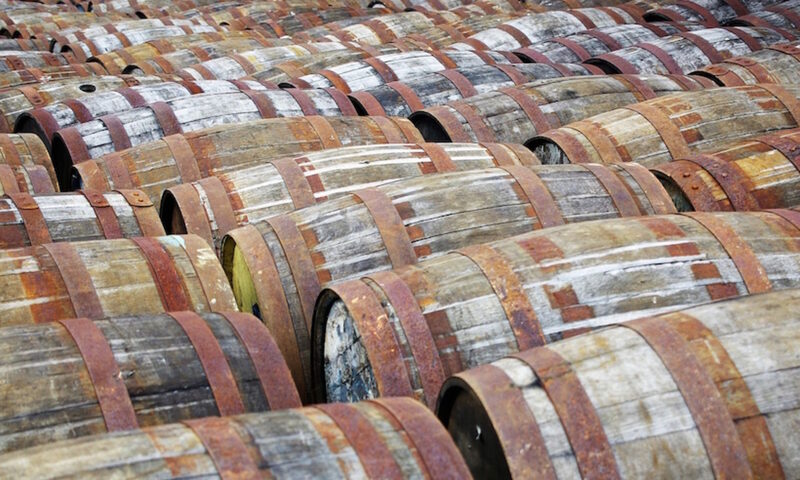 It’s old fashioned whisky and something that every whisky geek should have a taste of – things have changed over the years and while this isn’t how it was back when it was bottled, it’s the closest we’ll get to finding out what whisky tasted like back then. Jamie Milne liked this on Facebook. Steven Kelly liked this on Facebook. Becky Paskin liked this on Facebook. Johanne McInnis liked this on Facebook. Colin Hampden-White liked this on Facebook. Joe Clark liked this on Facebook. Nicolas Vaughn liked this on Facebook. Sam Simmons liked this on Facebook. Marcel Van Gils liked this on Facebook. Denis Balibouse liked this on Facebook. Dirk De Vos liked this on Facebook.